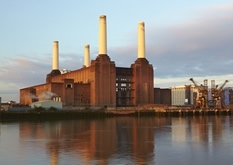 The construction of Battersea Power Station began in 1927 and the final chimney was added in 1955. Since its closure in 1983, little has been done by way of repairs and some elements have been removed. The structure has therefore been exposed to the weather with no internal heating for a long period of time. The structure is being redeveloped for mixed use and includes residential accommodation in the annex areas on either side of the building and the wash towers. As a grade II* listed building, the appearance of the external brickwork is to be retained. The residential space includes exposed internal brickwork as a major feature; there is consequently little opportunity to upgrade the thermal insulation of the brickwork which is generally 1½ bricks thick. The client had concerns about the current condition of the brickwork as the moisture content was unknown. Also, as the redevelopment progresses and residential space is created, the internal space will be heated. It is not known whether now or in the future, if the moisture condition of the brickwork is such that there may be a risk of dampness, frost attack, salt deposition or internal mold growth. Lucideon was engaged to take representative samples of the brickwork, evaluate the current moisture content and distribution, and characteristics of the brickwork in various parts of the building. Subsequently, Lucideon appointed Leeds Beckett University to carry out hygrothermal modelling using sophisticated software to understand the movement of moisture in the walls over a one year period when subjected to typical weather conditions externally and a fairly harsh temperature and relative humidity regime internally. The conditions were then analyzed to indicate the likelihood of internal surface condensation and mold growth, and frost attack on the external surface. At the original site visit in May 2014, it was noted that the brickwork was formed of large areas of relatively uniform quality brickwork with no excessive staining or local failures. This lent itself to an approach whereby each elevation could be notionally divided into quite large panels, and considered 'uniform' in the sense that just two areas would be chosen for sampling. One sample would be taken at a high level and one at a low level to cover one more and one less exposed condition. Tests were carried out to determine all of the characteristics required as input to the hygrothermal model, e.g. thermal capacity and conductivity, water vapor diffusion factors and moisture storage functions. Leeds Beckett University used WUFI® software, developed by the Fraunhofer Institute of Building Physics, which is underpinned by extensive research and has been validated against physical measurements taken in laboratory and field conditions. The initial moisture content and distribution was taken from the cored samples for each location. At the request of the building insurers, the internal conditions were set to a relatively harsh environment; standard industrial kitchen conditions. The external conditions were those of a typical year derived from long-term measure values and input as hourly data to the simulation. The simulations at the various locations demonstrated that the risk of surface condensation, mold growth and efflorescence (salt migration to the surface) on the inside surface of the walls is low. The simulations proved that the outer layer does not become wet enough to risk freezing when saturated. This compliments the results of freeze thaw tests on bricks from the site which subjected them to a very severe frost environment and showed them to exhibit sufficient frost resistance for much harsher conditions. The client is making significant investment in the project which will include very high-end retail and residential accommodation. The tests and modelling indicate that with some modification to the internal relative humidity from that assumed, there are unlikely to be moisture related issues in either type of space. The air conditioned environment will more than adequately eliminate risk and hence no extra costs need to be incurred as a result of unexpected moisture effects in the fabric of the building.